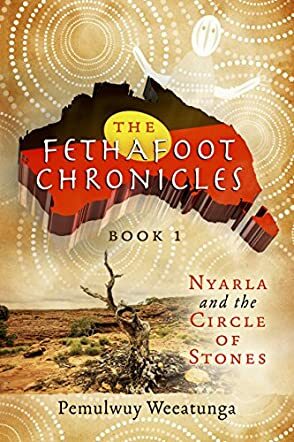 Nyarla and the Circle of Stones is the first book in The Fethafoot Chronicles by Pemulwuy Weeatunga. At the time of the big invasion by the Ghost people, Bidjigal warrior Pemulwuy of Eora Country led his clan to victory in a 12-year war against the Ghosts, enabling the people of Eora Country to stay hidden, keeping their cultural secrets safe. With the formation of the Fethafoot Clan, warriors were trained to the pinnacle in strength, fitness and weaponry as well as spirituality, magic and telepathic skills. The terrifying reputation of Kadaicha-man spread fast across the land, resulting in those who broke the laws of the Elders to have good reason for fearing the repercussions, as the Fethafoot Clan were able to see and hear through the eyes of the animals of the land, sea and sky. With the men and women in each tribe deemed equal, their respect for each other brought about a harmonious lifestyle which enabled them to survive the harshest of weather each time the Goddess cleansed her skin (the land) with floods, fires and volcanic eruptions. As an Indigenous Australian, I am all too familiar with Fethafoot (Kadaicha-man – feared Judge, Juror and Executioner of our people), which is why I selected this book for review. Narrated in Dreamtime fashion, Nyarla and the Circle of Stones is a gripping read for those who enjoy hearing true tales of Indigenous life. Pemulwuy Weeatunga takes the reader through the beginnings, the culture, the history, the invasion and the spirituality of Indigenous Australians, along with the vital relationship which Indigenous Australians have with the land and the ancestors. It is so refreshing and uplifting to read a book which does not start with “Australia was discovered by Captain James Cook,” which is the typical modern day history of our land as written by the Ghosts. I found Nyarla and the Circle of Stones to be educational, informative and in depth. I recommend it to readers of all ages worldwide who prefer to read true history ahead of fabricated history, and I hope to see this fascinating book stocked by libraries worldwide some day.